Hey guys! I'm so excited to share that throughout the month of May, I'll be teaming up with The Dr. Oz Show to create and share super fun snack and dessert recipes as part of their #28DayShrink challenge to trim down belly fat before summer. As you guys know, I'm ALL ABOUT indulgences, but I've also shared how balance is important to me, too (and not just because I have to go on TV every so often--though that's definitely a big part of it!). To me, true indulgences are things that are really luscious and worthwhile. And I mean really worthwhile. I don't want a handful of stale cookies or something from a vending machine; I want a lush super ripe pile of strawberries dipped in dark chocolate, a runny and crispy-edged fried egg served over a bed of beautifully-dressed greens, or a perfectly juicy and well-seasoned roast chicken with herbed quinoa salad on the side. Basically it's the good stuff, which is why I LOVE this challenge. It's about skipping all that so-not-worth-it stuff, and replacing it with loads of yummy, real ingredients like avocados, eggs, whole grains, fresh seasonal fruit and veggies, and protein. It's super do-able and very easy to personalize. Even better? 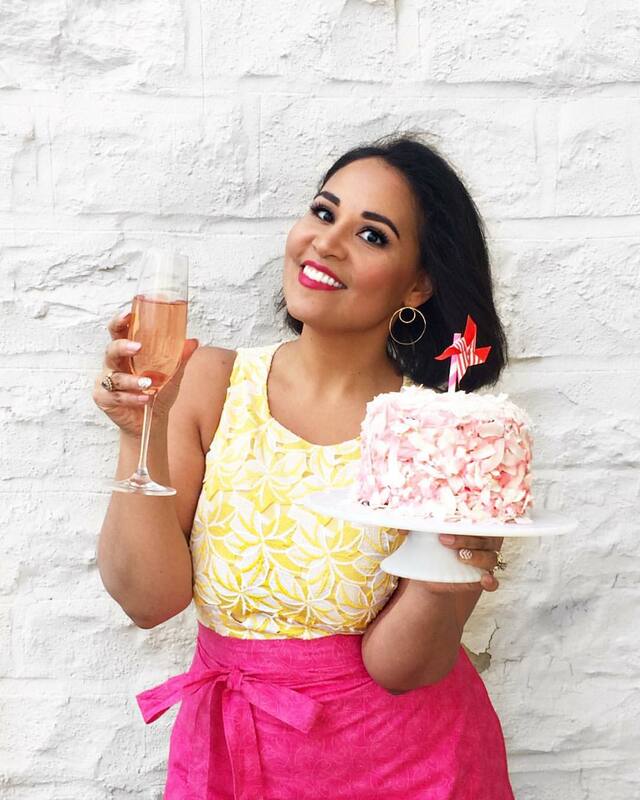 They've asked me and two other awesome food bloggers to take those ingredients and turn them into gorgeous, super Instagram and Pinterest-worthy recipes that you can eat and enjoy as you follow this program. Basically our job is to inspire you and keep you loving the food so you make it all the way through the challenge. 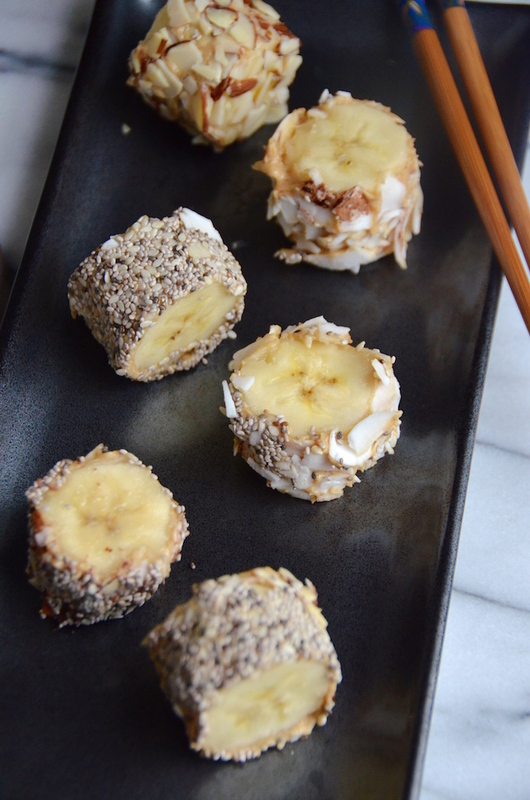 I'm going to be sharing healthy snacks and desserts that feature MUFAs (like these Banana Dessert Sushi). MUFA stands for monounsaturated fatty acids, and are found in nuts, seeds, olives, avocados, and other fabulous ingredients. They're essential for keeping you full and helping cut down belly fat. Also, they are some of the most delicious things on earth! Beth from Blue Barn Kitchen is handling breakfast with all kinds of fun avocado and egg recipes (I'm kind of jealous that it's her job to make avocado recipes now--not gonna lie). Everyone on the challenge will be taking pictures and sharing their ups and downs and successes and questions using the hashtag #28DayShrink. The fun starts May 1 and continues throughout the month, so be sure to join us! This is a version of the recipe that I shared on The Dr. Oz Show today. 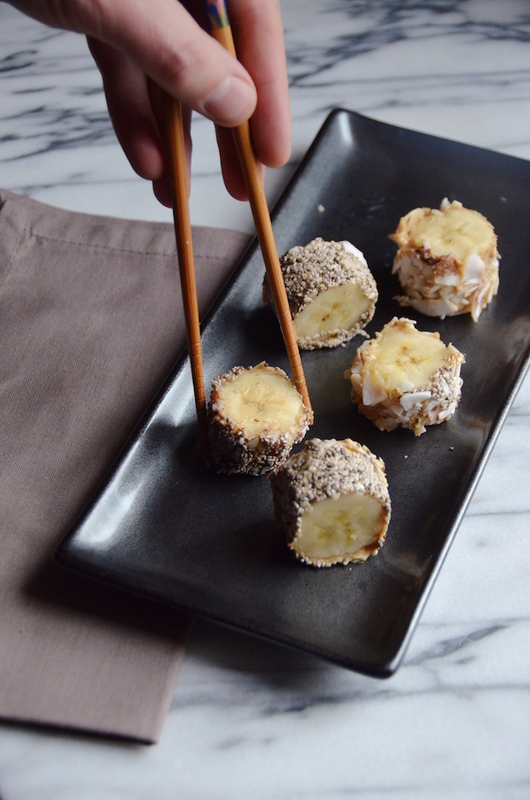 It's a Banana Dessert Sushi (aka MUFA Rolls!) that tastes as good as it looks. 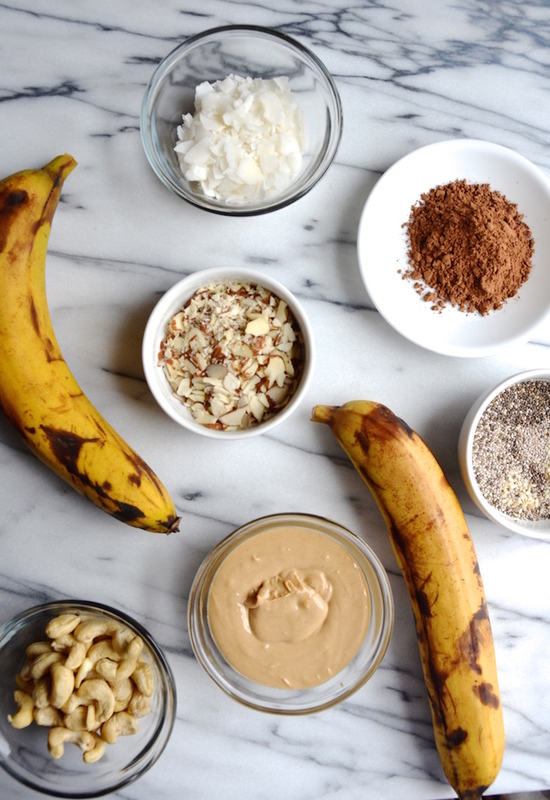 Super easy to make--it's simply a banana rolled in your favorite nut butter and a variety of seeds and nuts. You can get really creative, too! Add spices like cinnamon or nutmeg, or sprinkle on some raw cocoa nibs or cocoa powder. P.S. I recommend making a few in advance and keeping them in the freezer for a healthy snack or sweet treat to enjoy throughout the week! Spread chopped nuts and seeds on a shallow plate and roll banana over it, pressing lightly so that the nuts and seeds stick to the banana. 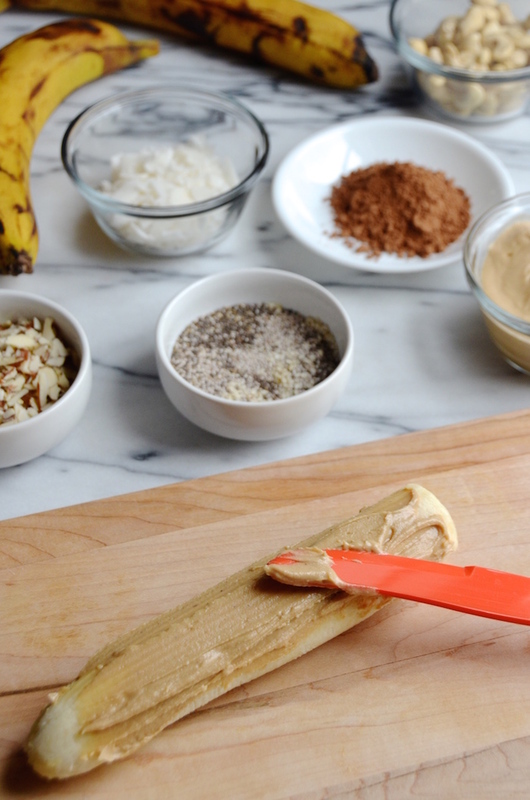 Slice covered banana into 1" thick slices. Eat immediately OR place in the freezer until solid, then transfer to a zipped bag to store. Note: Each daily serving is 1/2 banana (or approximately 3-4 sushi pieces). 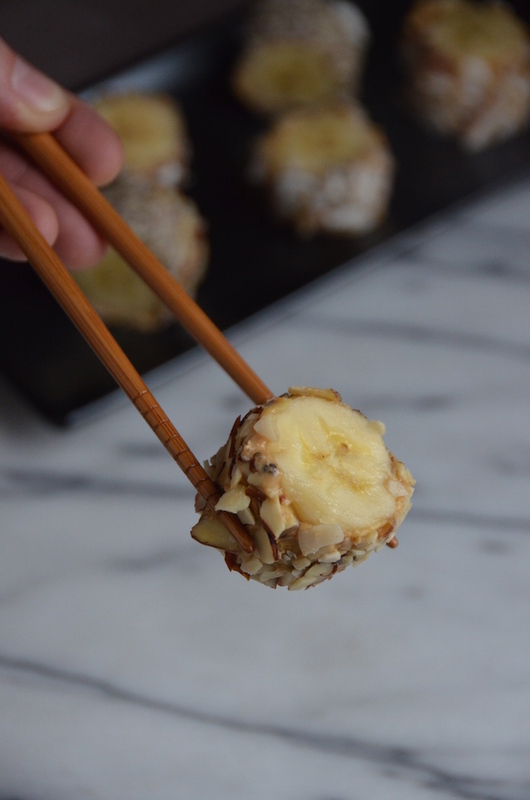 I recommend making 2-3 whole bananas at a time, then storing in the freezer to enjoy a few bites at a time as a snack or healthy dessert.